SlashDB version. 0.9.51 is now available everywhere for production and develoment. This new version is the second and the last planned revision of the 0.9.x series, but it packs more features than a minor version release might suggest. SlashDB has always been capable to run load-balanced on multi-core systems, but until now the forked processes would run independently. Any changes made to models, queries or users would require a restart of the system. The new version features a full live synchronization between processes and nodes, so any change made to any node will propagate to all. You can add new databases, turn a database offline or trigger the reflection of a database model into API. Add or remove users, change API keys or add modify queries. The implementation utilizes a separate memcached daemon so the synchronization can even work on clusters of SlashDB machines. Why does it matter? As your website, mobile app or data service increase in popularity so will the API traffic. You want to ensure that your API service is resilient and can scale. This has been a popular request from many of our users for some time, and now it’s here. Suppose you want to fetch data, which matches not one but several different values. Previously you would have to send separate requests. Now it is as simple as separating the values with a comma. Why does it matter? Quite simply it allows for more powerful queries without having to resort to SQL statements. SlashDB works for reading and writing. It always has, since the very first release. Unfortunately that powerful feature has been somewhat hidden. Starting from this release we are adding data editing to the GUI. In the new version you can edit or delete individual records in the GUI. Simply navigate to any record and hit the Edit button. The screen will turn into a web form allowing you to change field values. Similarly you may delete the record using the Delete button. Both actions translate into SlashDB API calls PUT and DELETE respectively and operate subject to the current user’s permissions. By the way, pretty much anything you do in the GUI has an equivalent API call underneath. Why does it matter? Fix data errors easier and quicker. It also reminds the developer that SlashDB can be used as a backend even for highly complex and interactive web applications. SQL Pass-thru is a popular feature because it allows API and database administrators to collaborate on the library of defined queries and to keep them all in one place. From this release your queries can me mapped to suitable HTTP method. For example an “INSERT INTO …” statement or a stored procedure call can be mapped to the POST method (verb), while a “SELECT * FROM” would typically get associated with the GET method. 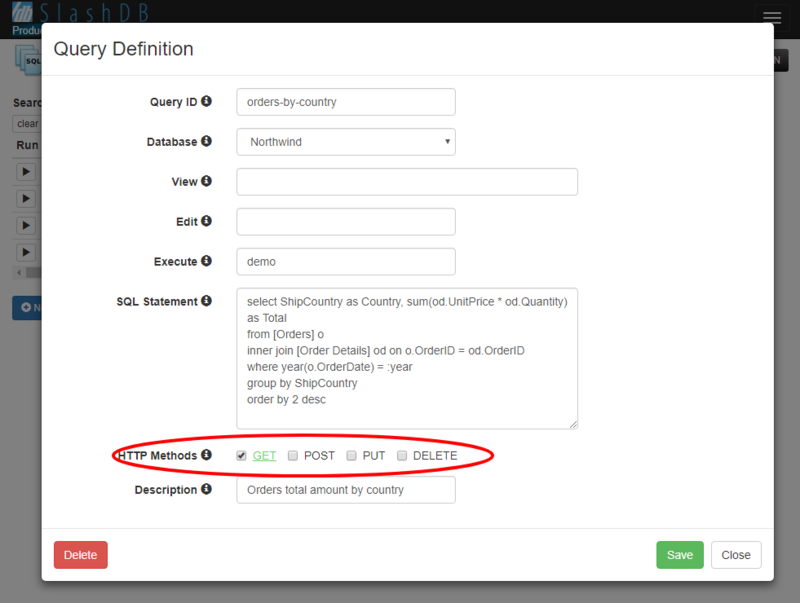 SlashDB even hints on the most suitable method to use based on the the query text. Why does it matter? It allows for better conformance to RESTful principles, which dictate that GET requests should not be used for modifying resources. We are focused on making SlashDB easy to understand for the first time users. At the same time we invest in an in-depth knowledge base, so those who are already experienced can leverage the product’s full capabilities in their work. Our new User Guide features detailed product walk-through with screenshots and videos. Please bookmark it and check often as it improving almost daily. On this blog articles in the “how-to” category contain tips, which may be useful for you in applying SlashDB to HTML5 apps, enterprise application integration, data science and more. There are number of improvements to the admin user interface in the new version. Our objective here is to help first-time users avoid common configuration mistakes. List sorting in database/user/query definition screens. User friendly HTTP error responses when parsing JSON fails. 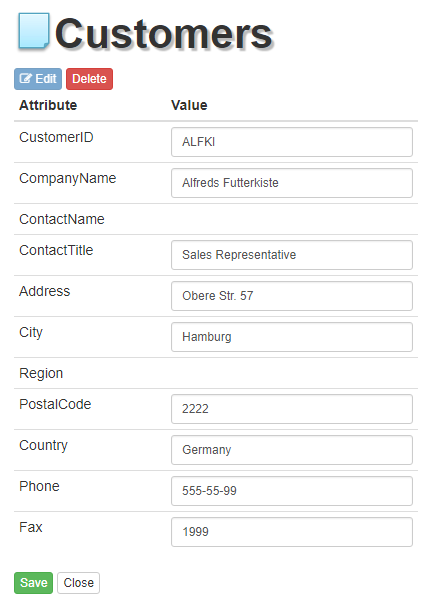 Removed owners list from the Query Definition modal. Use View, Edit and Execute instead. The new version of SlashDB is available for download for on-premises installation as well as in the cloud. SlashDB is offered entirely FREE for development purposes without any time limitation. Plus, we are cutting prices for smaller instance sizes on Amazon and Azure. Now you can run SlashDB for under $12 on Amazon or under $15/month on Azure for the smallest instance size. A medium sized instance is around $50 all-in.